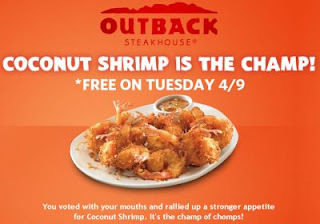 Freedom Rockz: Free @ Outback w Any Purchase Yum! Free @ Outback w Any Purchase Yum! *TOURNEYTIZER TUESDAY OFFER VALID WITH ANY PURCHASE ON TUESDAY, 3/26/13,4/2/13 AND 4/9/13 ONLY. No coupon necessary, say "TourneyTizer" to your server to receive the offer. One per table, per visit. Offer valid for lunch or dinner, dine-in or Curbside Take-Away® (not valid for online ordering). Offer is not valid in conjunction with any other discount or offer and has no cash value. Offer valid while supplies last. Prices and participation may vary by location. Selection of winners will be at Outback’s sole discretion.